Patch between Complete Alchemy and Cooking Overhaul and Ordinator - Perks of Skyrim. Permission obtained from kryptopyr and EnaiSiaion to make the patch. Any content in my patch is derived from their works, please consult with them regarding permissions. Nexus didn't want to upload 1.52, trying again. 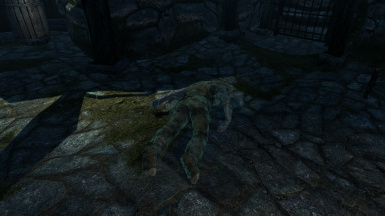 Poisoner reduced from 1% per level of Alchemy to 0.5%, it was just too strong with the new ingredients. Fix bugs with the Advanced lab. All CACO options should work. Main and Optional file updated to reflect Ordinator 5.31 changes. Main and Optional file updated to reflect Ordinator 5.25 changes. Main and Optional file updated to reflect Ordinator 5.16 changes. Fixed Double Toil and Trouble so that it works correctly with the renaming function in CACO. Main and Optional file updated to reflect Ordinator 5.00 changes. Main and Optional file updated to reflect Ordinator 4.19 changes. Updated Optional file to reflect CACO 1.12, main file untouched. Updated Optional file to reflect CACO 1.1, Main file is untouched. Updated for Ordinator 4.10, changes to respec form list. Temporarily removed Double Toil and Trouble from the perk tree. Updated to reflect CACO 1.04. Fixed a missing condition in MGEF 000F3934, thanks Astakos. Changed Feed the Monster to use the smaller portion Raw Hominid Meat. Updated to reflect latest CACO changes. BETA Ordinator tree added. Please test and provide feedback. Love Ordinator? Love CACO? Now you can have both! If you prefer the CACO tree, use the main file. It will fix the compatibility issues between the two mods. If you prefer the Ordinator tree, use the optional file. It uses the Ordinator tree but adds in the crafting unlocks from CACO. This way you get Ordinator's balance with CACO's new recipes and changes. There are a few minor tweaks as detailed below to maintain balance. For either option always load CACO after Ordinator. Main File - Fixes compatibility issues. Full CACO tree, lose out on Ordinator perks. Optional File - Fixes compatibility issues. 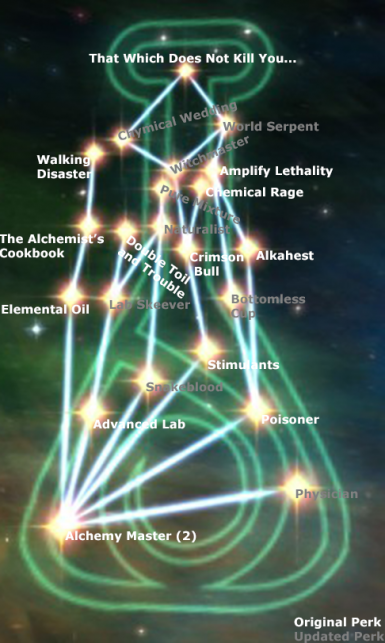 Full Ordinator tree with CACO functionality. Recommended! Deep Freeze effects carried over from Ordinator. Catalyst perk added to respec script from Ordinator. 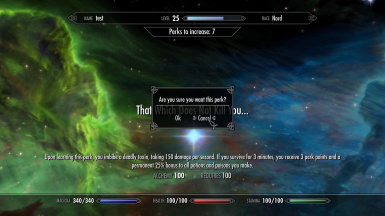 Feed the Monster perk from the Conjuration tree of Ordinator now uses Raw Hominid Meat. Physician - Create poultices, tonics, and healing salves. Health regenerates 15% faster. 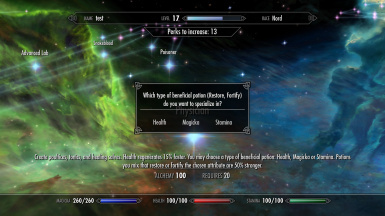 You may choose a type of beneficial potion: Health, Magicka or Stamina. 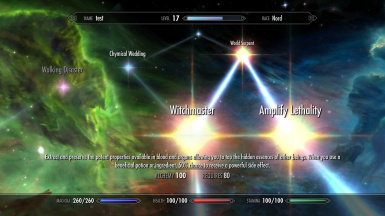 Potions you mix that restore or fortify the chosen attribute are 50% stronger. 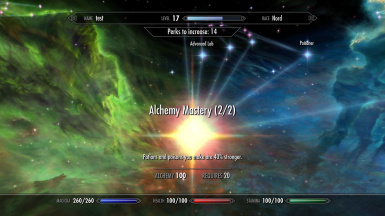 Poisoner - Poisons you mix are 0.5% more powerful per level of Alchemy. 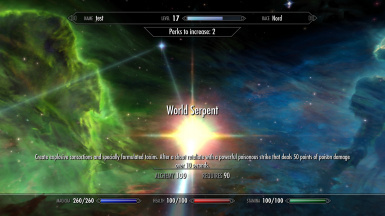 World Serpent (Catalyst) - Create explosive concoctions and specially formulated toxins. 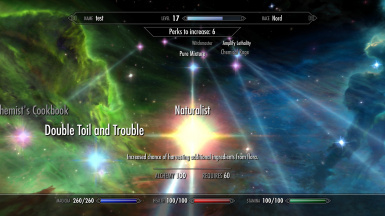 After a shout retaliate with a powerful poisonous strike that deals 50 points of poison damage over 10 seconds. 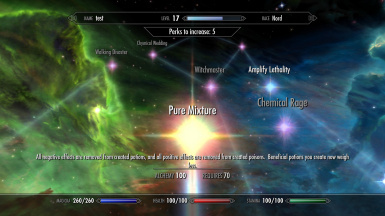 Pure Mixture - All negative effects are removed from created potions, and all positive effects are removed from created poisons. Beneficial potions you create now weigh less. Witch Master (Anatomist) - Extract and preserve the potent properties available in blood and organs allowing you to tap the hidden essence. When you use a beneficial potion or ingredient, 50% chance to receive a powerful side effect, randomly chosen from a range of 40 side effects. 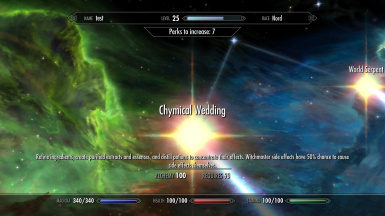 Chymical Wedding (Chymist) - Refine ingredients, create purified extracts and essences, and distill potions to concentrate their effects. Witchmaster side effects have 50% chance to cause side effects themselves. 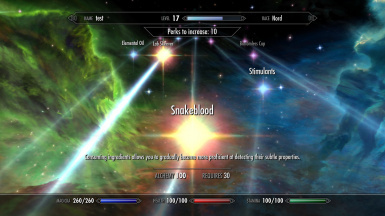 Snakeblood - Consuming ingredients allows you to gradually become more proficient at detecting their subtle properties. Your resistance to poisons and toxicity increases with the number of ingredients you consume. Naturalist - Increased chance of harvesting additional ingredients from flora. 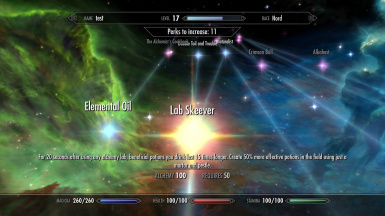 Lab Skeever (Field Alchemist)- For 20 seconds after using any alchemy lab, beneficial potions you drink last 15 times longer. Create 50% more effective potions in the field using just a mortar and pestle. 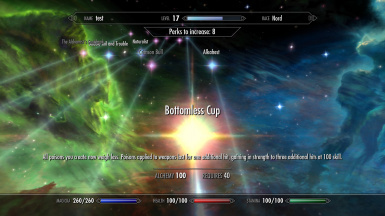 Bottomless Cup - All poisons you create now weigh less. Poisons applied to weapons last longer, up to 3x as long at 100 Skill. For a new game just follow the install instructions for Ordinator and CACO, then install this patch. Enjoy. For an existing game make sure all of your perk points are refunded then install. Enjoy. Refund all of your perks, remove this patch. Should be compatible with anything CACO and Ordinator are compatible with. This is just a mashup of other people's hard work, thank them for bringing you these awesome mods.